German infantry of an assault division in training for the Spring Offensive (taken by a German photographer). Image no Q 55483, courtesy of the Imperial War Museum. The German Spring Offensive, or Kaiserschlacht, was the last German attempt to win the war. They held the strategic initiative and their troops were bolstered by the return of men from campaigning in Russia. The offensive began with “Operation Michael” starting on March 21st. It took place in the St Quentin area and fighting covered much of the same ground as the 1916 Battle of the Somme. The offensive continued with Operations Georgette (Battle of the Lys), Blucker York (Third battle of the Aisne) and Gneisenau (Battle of the Metz). On March 21st 1918, the Germans launched a massive offensive in the area between Arras and La Fère against the British Third and Fifth Armies; included in the latter was the 36th (Ulster) Division which was decimated during this campaign. The Germans opened the attack at 04.40 a.m.and pounded the British for five hours with over a million shells. These high explosive shells wreaked havoc on the trenches where men had to contend with mustard, chlorine and tear gas as well as the impact. Support systems behind the lines were badly damaged by the explosions. At 09.40 a.m. infiltrating elite stormtroopers led an assault, attacking through a morning mist thickened by artillery and trench mortar smoke. Serious breakthroughs of the British line occurred, particularly around the southern position of the Fifth Army. Many British troops there were taken prisoner. One of the units present was the 2/7th Manchester Regiment fighting with the 66th Division. They suffered extremely heavy losses, similar to the 36th Division, and afterwards had to be withdrawn from the line. March 21st 1918 Private 42408 John Phillips, 2/7th Manchester Regiment, 66th Division, who enlisted from an address in Radcliffe on Trent, was reported wounded and missing. He was captured and died on May 31st 1918, age 24, while in the hospital at Meschede prisoner of war camp, Germany. Among the Irish infantry facing the Germans was the 1st Irish Fusiliers. They became isolated during the intense barrage and lost contact with supporting units. By the end of the day their casualties included 275 other ranks missing – many were later discovered to be casualties. One of the missing was from Radcliffe on Trent. “I saw Pte Bolton wounded in the hand by shrapnel, about 11 am on 21st March 1918. He was taken back to the Dressing Station at Serracourt which was captured about 4 pm. I did not see him again. He was 5ft 4in, fair, clean shaven” (Informant Private Kelly, 98711st Royal Irish Fusiliers, A Coy speaking to the Earl of Lucan Red Cross Society). By the evening of the 21st, just under 15,000 men from Britain and the Commonwealth had been killed and around 21,000 of the 90,000 men quoted as missing had been taken prisoner. One of the prisoners (who was released after the Armistice) was George Newham from the 2nd Bn Sherwood Foresters, 6th Division, Fifth Army. He was a regular soldier from Radcliffe on Trent who was wounded in the thigh then captured on this day. The Fifth Army bore the brunt of the losses; a limited withdrawal was issued during the night of March 21st. 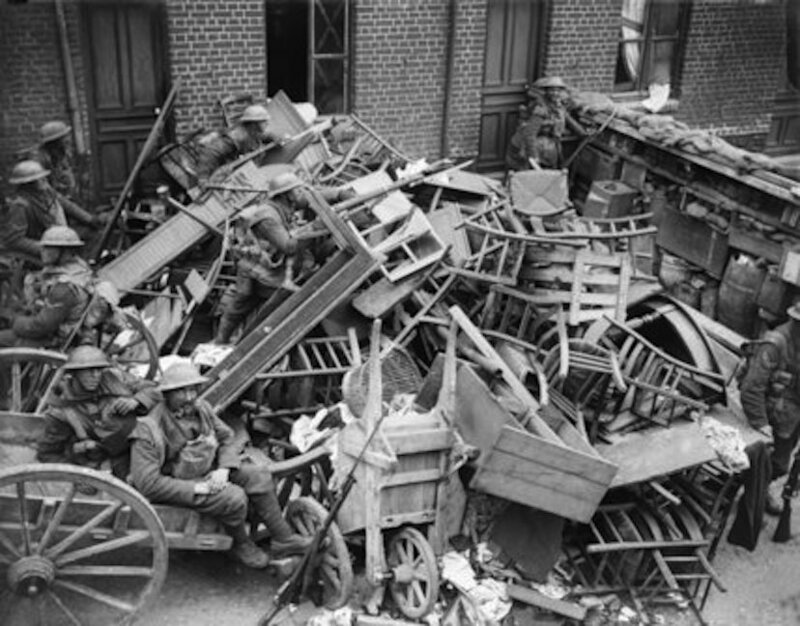 By the end of Operation Michael, which involved sixteen days of intense fighting, both the Allies and Germans had lost around a quarter of a million men each, plus a considerable amount of artillery and supplies. In “Operation Georgette”, the second phase of the spring offensive, the Germans planned to smash through British lines and advance to the Channel by capturing Hazenbrouck, regaining control of Ypres and cutting off the Allies to the north. The Battle of the Lys began with a heavy German artillery bombardment and ended with massive loss of British ground. Nevertheless, the German plan failed. Both sides suffered heavy casualties. First and Second Army were present. 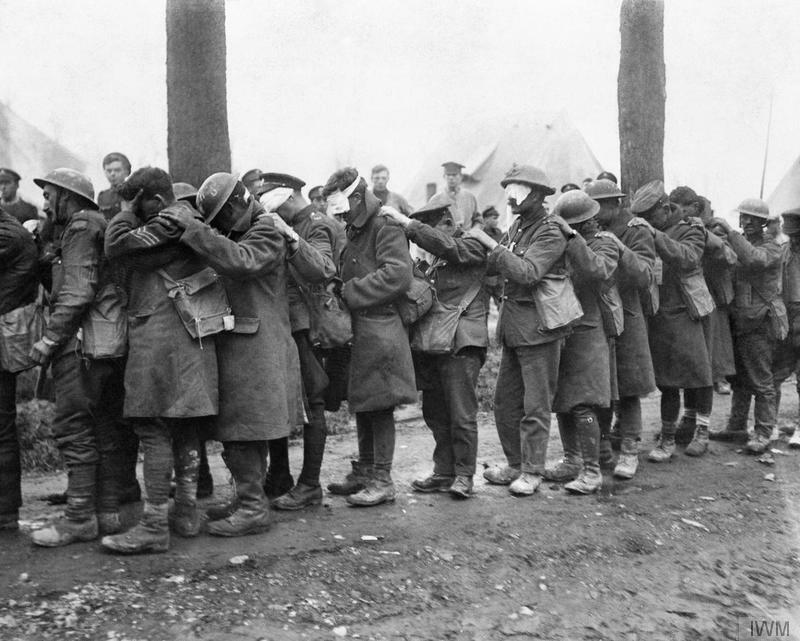 British troops blinded by tear gas awaiting treatment at an Advanced Dressing Station near Bethune, 10th April 1918. Image Q11586 by official photographer Lt. T.K. Aitken courtesy of the Imperial War Museum. The Germans broke through the southern part of the line between Armentières and Festaubert, overwhelming the Portuguese 2nd Division. They continued to Estaires where they were halted by British reserve divisions. The huge crisis for the British at this point was acknowledged by Sir Douglas Haig in his Special Order on April 11th: “With our backs to the wall and believing in the justice of our cause each one of us must fight on to the end”. April 10th 1918, Belgium. Death of Lance Corporal 267276 James Harris, 1st/6th Bn., Northumberland Fusiliers, 149th Brigade, 50th Division. He was a married man with children who lived in Radcliffe. He died on April 10th, age 29. There is no information available about the details of his death. The Battalion war diaries were not written up in early April, due to the heavy number of casualties and possibly no officer to write them (Information from later entries in Northumberland Fusiliers war diaries). In this part of Operation Georgette the Germans pressed forward to take Bailleul, 12 kilometres west of Armentières. General Plumer, commander of the Second Army, withdrew troops from Passchendaele which was retaken by the Germans on April 16th. The Lincolnshire Regiment was present with the 59th Division. Men of the 1st Bn Middlesex Regiment holding a street baricade at Bailleul, near Belgian border, April 15 1918, immediately before the town was captured and devastated. Image no. Q6530 by official war photographer Lieutenant John Warwick Brooke, courtesy of the Imperial War Museum. 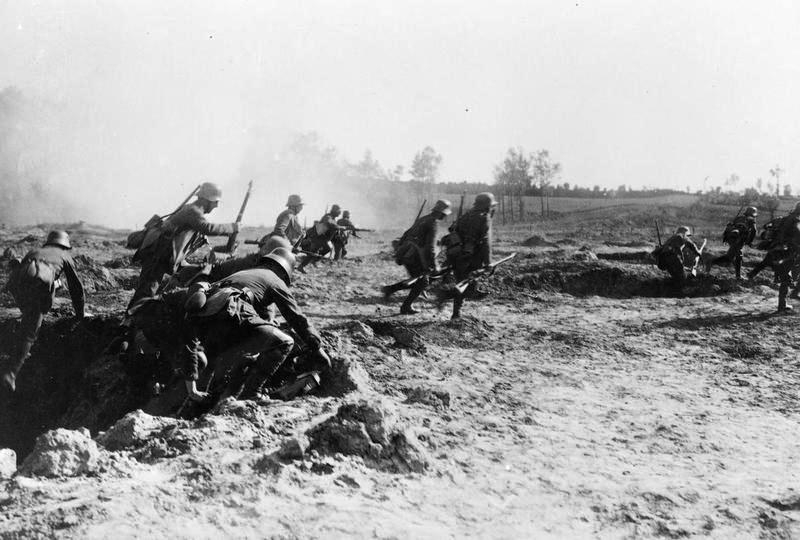 The Germans had problems with supply lines and following through successful attacks throughout Operation Georgette while French reinforcements and British reserves helped prevent further advances. By the end of April, it was clear that the attack on Hazebrouck had failed, the Germans could not achieve their objectives and Operation Georgette was called off. Estimates of British casualties vary between 76,000 and 82,000. German casualties are also estimated at around 82,000. April 15th 1918, Onraet Wood, Belgium. Death of Private 53239 Benjamin Sheppard, 2nd/5th Bn. Lincolnshire Regiment, 177th Brigade, 59th (2nd North Midland) Division. He had lived at Green’s Barn Farm, Radcliffe. Died of wounds April 15th 1918, age 19. On this day, the 2nd/5th Battalion advanced from Onraet Wood to Stanyzer Cabaret and were subjected to a heavy barrage of fire on the road. No specific information about when Private Sheppard was wounded. On night of April 10th 2nd Lincolnshire Regiment received orders to march and occupy a gap in the line from Onraet Wood to Stanyzer Cabaret, the 12th/13th Northumberland Fusiliers filling up the gap further south. When proceeding down the Vierstraat-Wytschaete Road, the advanced guards came in touch with the Black Watch at Grand Bois, after which point no troops were met, but abandoned guns were pulled across the road. The battalion made good the road from Onraet Wood to Stanyzer Cabaret, and at about 4.30am on the 11th got in touch with the Black Watch on our left at Onraet Wood, and the 12/13th Northumberland Fusiliers on the right; a few enemy patrols were met with on the right, and shots exchanged; the road we were on was then subjected to a heavy barrage. At 5.30am according to orders, 2nd Lincolnshire Regiment advanced and occupied the Corps Line of Posts from Somer Farm to Stanyzer Cabaret. During the advance and during the day the Battalion captured 14 prisoners from 4th, 393rd and 76th Regiments and killed a good lot more by Lewis Gun and rifle fire. The advance was carried out during a very dark night, at very short notice and over ground which was only known to a very few people in the battalion, and was carried out up to time without a hitch. The battalion remained in this line till relieved on the night of 15/16th, during which time the position was repeatedly very heavily shelled, and numerous casualties were inflicted on the enemy by Lewis gun and rifle fire, and touch well maintained with the enemy by patrols. After relief on the morning of the 16th the Battalion marched back to Camp at Rossignol Wood, which they reached at 4am, and stood to and reconnoitred the Vierstraat Kemmel Road trenches. An hour after standing down orders were received to man the trenches, and soon afterwards to advance with No 2 Composite Battalion, 39th Division, and attack and capture the Peckham-Maedelstede Farm ridge. The attack was cancelled… .